After I made a loaf of Coconut Milk Banana Bread and patted myself on the back for using the remaining coconut milk from an opened 13.5 oz can, I went to the store and spotted a new product – Culinary Coconut Milk. It’s coconut milk that comes in a re-sealable carton. I wish I’d spotted it sooner. Has anyone out there tried it? If you didn’t know about the new carton-style coconut milk and are still looking for ways to use up an opened can, this is a good recipe. 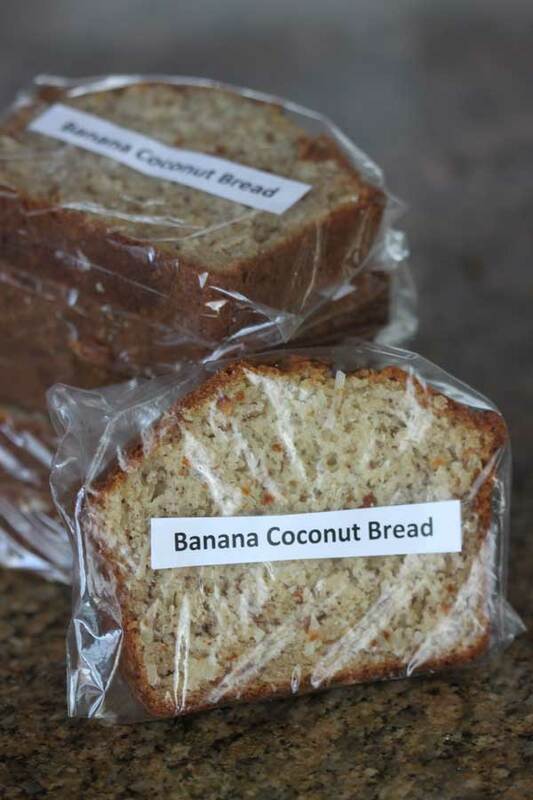 There are a few different coconut milk banana bread variations, but the one that looked the best to me was from a blog called Fat Girl Trapped in a Skinny Body. She actually used self rising flour plus a combination of baking powder and baking soda. I spaced out and used bread flour, which was NOT self-rising, and the bread still rose perfectly. I’m sure regular all-purpose would work. I also used full-fat coconut milk rather than lite. The coconut milk flavor is not really prominent. As for the shredded coconut, it was okay, but unless you really love coconut it would be fine to leave it out. 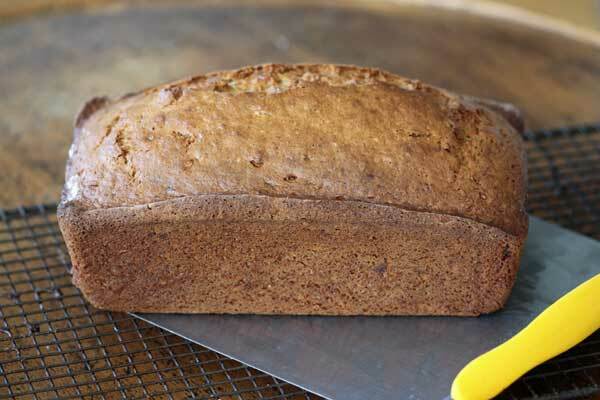 All in all, it was a really good banana bread with a great shape and enough richness to serve at a function or give as a gift. I’d definitely make it again. 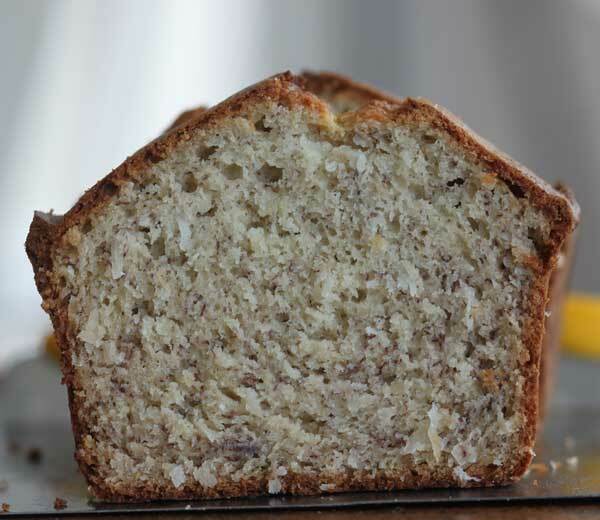 However, I might still try a few other variations of coconut milk banana bread. Preheat the oven to 350°F. Grease a 9x5 inch loaf pan (no smaller) and line with a strip of parchment if desired. Whisk together flour, baking powder, baking soda and salt and set aside. In a mixing bowl, using an electric mixer, beat the sugar and oil. Add the eggs and beat on high speed, incorporating a lot of air into the mixture. Beat in the vanilla and almond extract. Combine the mashed banana and coconut milk, then add to the batter alternately with the flour mixture. Pour the batter to the prepared baking pan and bake for 60 to 75 minutes (mine took 70) or until a toothpick inserted in the center of the loaf comes out clean. Let cool for about half an hour, then remove from pan. For the flour, weight out 11.5 oz or really stir and aerate before measuring. Anna, that ice cream sounds delicious!!! Good to know! I plan on using it in ice cream, so I’ll let you know how it works. I suppose I’ll need to water it down some with almond milk, cashew milk or the drinkable coconut milk that comes in a carton. From the So Delicious website: “What’s The Difference Between So Delicious’ Culinary Coconut Milk and the Stuff that Comes in a Can? The package is re-sealable, which is really nice for when you don’t use the entire amount of product at once. Ours is fresher and doesn’t have any metallic taste from sitting in a can. Ours is actually denser than the kind that comes in a can, so you can use 11oz. of ours as an equivalent to the 14oz. can.” I thought you might be interested, if you weigh baking ingredients like I do. I will be looking for this at the grocery stores I go to – thank-you so much for the heads up about it! This sounds scrumptious! I hope to find the resealable coconut milk too! Sue, that’s great! Glad you found a good one. I know I have too many banana bread recipes, but for some reason it’s one of my favorite things to make. I made a different banana bread recipe of yours last weekend. It was great.